This is a photo of a 64 gallon compost cart, also variously called rollout containers, polycarts, and rollcarts. How could this container help keep our streets clean while saving municipalities hundreds of thousands of dollars each year? The collection of leaves and yardwaste is a statewide challenge for NJ municipalities. Placed loose at the curb, they are expensive and messy to collect. Some of the downsides (detailed here) are the hazards of blocked traffic and bike lanes, global warming gases from all the scraping, hauling and industrial composting, nutrient runoff into streams, impoverished and hardened urban soils, bias against homeowners on busy or narrow streets, the noise of leaf blowers, and a scarred streetscape. Collection of loose yardwaste requires a caravan of two, sometimes three heavy vehicles, while containerized collection requires only one. Streets tend to be messy from March through December. Though mulch-mowing, leaf corrals and raking leaves into the woods are easy ways to utilize leaves in the yard, many homeowners still want some sort of collection service. One reason why the piling of leaves and yardwaste is so popular is that it is highly visible and therefore imitated by neighbors. Mulch mowing and composting are easily done, but go unseen and therefore unimitated. A compost cart placed at the curb once per week is a visible symbol of an alternative to loose dumping. Leaf bags have up to now been the only containerized alternative offered by state municipalities. A compost cart is a sturdy, reusable means of containerizing leaves and yardwaste for collection, so that streets are less marred by loose dumping that is nearly year-round. Princeton already collects containerized leaves and yardwaste in leaf bags curbside, 26 weeks per year. Adding the compost cart option for homeowners greatly increases convenience, capacity and affordability, while requiring only an initial investment of $5000 to retrofit the collection truck with a hydraulic tipper hook. With the convenience and added capacity of compost carts, collection of loose leaves and yardwaste could be limited to the fall. Containerized collection can keep streets clean from March through September. Lids: Compost carts have lids, to keep contents dry. Wheels: Compost carts have wheels, for easy transport around the yard and out to the curb, even when filled. Less physically fit homeowners will appreciate this feature. Easier to fill: With a larger opening and rigid structure, compost carts are easier for homeowners to fill. Reusable: Unlike leaf bags, compost carts are sturdy, reusable containers. Reusability means homeowners don't need to continually buy more single-use leaf bags, or be dependent on the municipality's subsidized leafbag giveaway program. Quick payback on initial investment: If a compost cart holds the equivalent of 3 leaf bags (most leaf bags are not filled to capacity), then over the course of the existing 26 week collection program, a compost cart can hold the equivalent of about 80 leaf bags. Including staff time to staff the shed, the current leaf bag giveaway program costs about $2/bag. For the price of a $35 compost cart, the municipality can provide the same capacity to homeowners as $180 worth of leaf bags. Compost carts can easily last ten years, so multiply $180 by ten to compare with an equivalent capacity in leaf bags. Minimal space requirements: Though some homeowners may claim they don't have room to store a compost cart on their property, simple calculations suggest this fear lacks basis. A quarter acre lot=10,000sq. ft., a 64 gallon rollcart = 4 sq ft, therefore only 1/2500th of even a small lot is required. Appearance: Compost carts stay upright at the curb. Leaf bags tend to be unstable and tip over, looking messy and spilling their contents. Compost carts need only be at the curb on collection day, while yardwaste bags often sit for many days at the curb, getting wet in the rain. Strong Visible Symbol: Neighbors imitate their neighbors. When on the curb, a compost cart sends a signal to neighbors that they too can containerize their leaves and yardwaste. Otherwise, desired behavior is invisible. Cleaner streets: Many little piles of yardwaste mar the streetscape during the summer. 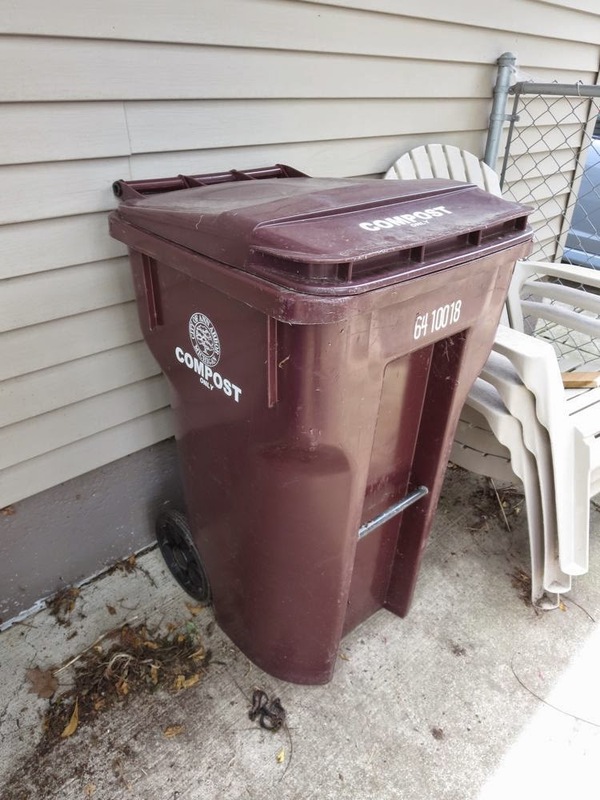 With roll carts, homeowners can store small amounts of yardwaste in the cart, away from the street, then place it at the curb only when it fills up. Proven success in similar climates: Ann Arbor, MI and Durham, NC provide good examples of municipalities with tree cover similar to Princeton's, where compost carts have successfully been used to collect leaves and yardwaste. Do not preclude leaf bag use: Residents wishing to supplement compost cart capacity with leaf bags, or use only leaf bags, may do so. Other uses: Compost carts can be used to easily transport leaves/yardwaste from the frontyard to a backyard leaf corral or leafpile. Long lifespan: The carts can last for decades. In its first ten years, a compost cart will provide $1800 in equivalent leaf bag capacity, all for the initial wholesale cost of $35. Potential to handle brush: If Princeton's composting center acquires a grinder that can accommodate both soft and woody material, residents could put sticks in the compost cart as well. Princeton currently requires all brush placed at curb to be no more than 3 feet in length. Compost carts are 3 feet high, and in Durham, NC, sticks are allowed to extend a foot or two out of the compost cart, so that even longer lengths could be accommodated if need be. Potential to combine with foodwaste collection: Some municipalities that collect leaves and yardwaste in roll carts have gotten the necessary permitting so that homeowners may also add foodwaste to the carts. Ann Arbor, Portland, San Francisco, and Seattle are but a few examples. This will be a great additional benefit if and when a facility near Princeton can handle the foodwaste/yardwaste mix. The existing 32 gallon roll carts used for the foodwaste program limit their usefulness for this double purpose. With 64 or 96 gallon roll carts already in use for leaves/yardwaste, Princeton will be well positioned to quickly add foodwaste composting town-wide in the future. Offer compost carts (64 or 96 gallon capacity) to homeowners, either free or for $50. Wholesale cost for the municipality was estimated by staff to be $35/cart. Collect weekly as part of the existing yardwaste bag collection service (no additional cost). At first, only non-woody yardwaste would be accepted--same as with yardwaste bags. As the compost carts become more popular, collection could be expanded beyond the current 26 week/year collection of yardwaste bags.